Tottenham Hotspur Football Club's proposed new stadium has been named as one of four London stadia selected for inclusion in England's Fifa submission for the 2018/2022 World Cup. 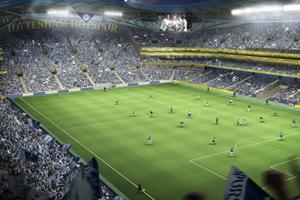 Tottenham Hotspur Football Club submitted a planning application to the London Borough of Haringey in October that would see a new stadium created on the site of the current of stadium. Tottenham Hotspur Football Club head of community relations Adam Davison said: "We are delighted to be included." London's host city bid was submitted with four suggested venues including Wembley Stadium, Olympic Stadium, Arsenal's Emirates and the new Tottenham Hotspur stadium. London is one of 12 cities that will host matches if the tournament is awarded to England for the first time in 50 years. If England wins the honour of hosting the Fifa World Cup in 2018 or 2022, Wembley will automatically stage the opening game and final. Some 12 venues-specific training sites and 14 team base camps have been put forward for the capital. Mayor of London Boris Johnson said: "With some of the finest stadia in the world and a passionate fan base for every team in the World Cup, London will offer an unrivalled backdrop to the thrilling action on the pitch. If the World Cup comes to the capital it will be a once-in-a-lifetime football experience for players and fans alike." London United team member and Visit London director of communications Ken Kelling said: "A World Cup bid needs a world city and London will no doubt play a central role in the national campaign to bring the Fifa World Cup to England."